Sneaking out shortly after the blistering revenge spectacle provided by John Wick, comes The Salvation, an atmospheric Western which also has its sights set on blood-drenched vengeance. 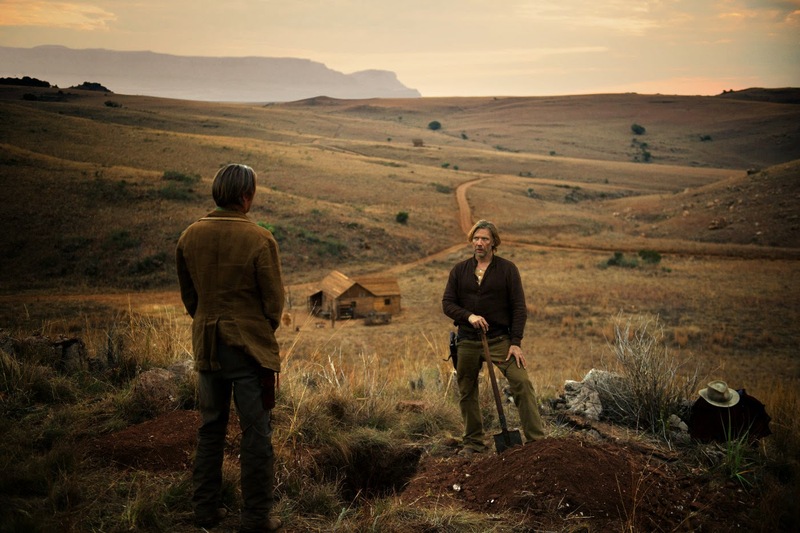 This Danish-South African co-production comes from Lars von Trier's Zentropa Entertainment and boasts an international cast of talent headed by Mads Mikkelsen and Eva Green. Whilst there is a certain cathartic pleasure to be found in director Kristian Levring's picture, the full potential of The Salvation feels unutilised due to its short run-time. However, it does provide much to enjoy thanks to an impressive lead turn for Mikkelsen, bold Western iconography, admirably gruesome bloodshed, and striking genre cinematography. 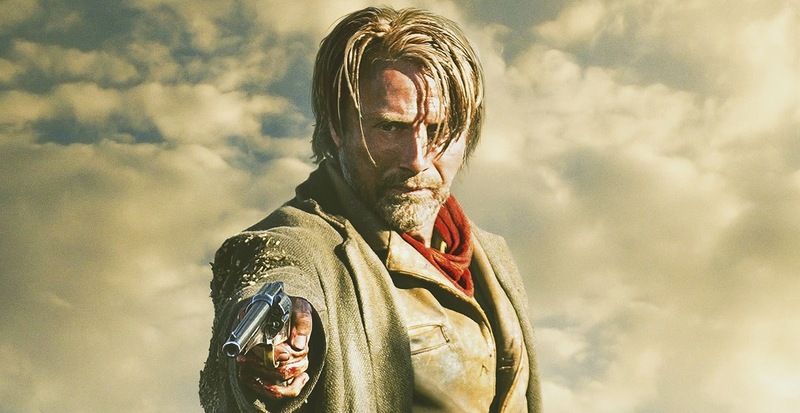 Mikkelsen stars as Jon, a Danish ex-pat living peacefully in the American Old West, however this peace is shattered when outlaws slay his newly-arrived wife and son. After unleashing his vengeance on the two men, Jon expects to return home and grieve - however, instead faces repercussions from Delarue (Jeffrey Dean Morgan), a gang leader and brother of one of the murdered outlaws. Without the support of the cowardly townspeople (lead by Jonathan Pryce) around him, the Danish settler is forced to take on Delarue and his gang on his own. Levring's passion for the genre is evident (he previously flirted with it in the desert set, The King is Alive, and has made a prior period drama with The Intended) which may serve as both a plus and a hindrance. A hindrances as perhaps as The Salvation has little to add to the revenge western narrative - the usual attributes are present (brutal attacks, ruthless gangs, unutilised female characters, weak townspeople, a strong but silent hero)- and these play out exactly as one would expect. However, there is a pleasing familiarity in this undeniably well-executed tale with Levring unleashing the right mix of character drama and high-octane western spectacle. Levring and co-writer Anders Thomas Jensen hook-us in with a premise as emotive as you would expect from a revenge film. Showing the picture-perfect, hopeful Danish family reunited for a prosperous new life in America - only to be cut down prematurely, taps into our primal human instincts and immediately absorbs us - ensuring that we are behind the Danish titan's retribution whole-heartedly. With this, Levring gives us the cold-blooded revenge that we want to see resulting in numerous set-pieces nostalgic of the classic Spaghetti Western. Taut cat-and-mouse chases through hill ranges, horribly tense execution scenes, and gleefully nasty revenge sequences (one involving a coffin stands out). All these sequences simply feel like build-up to the film's conclusion which will finally pit Jon against Delarue and put an end to this spiralling tale of chaos. Whilst there is a cathartic pleasure in seeing Jon take down former civil war veteran's gang, it never reaches the spectacle it deserves. The conclusion feels rushed and could have perhaps benefited from spending more time crafting something a bit more elaborate and a takedown befitting of the outlaw's cruelty. These scenes feel like Levring should have shown a little less restraint, allowing Jon to get lost in the chaos - instead, this feels occasionally stilted. Perhaps this reviewer has simply been spoilt by the gung-ho madness of Sundance favourite Slow West where we get this blistering conclusion we want. Cinematography from Jens Schlosser captures the enigmatic beauty of the sun-scorched Old West. With keen attention to detail, The Salvation allows us to get lost in this brooding setting packed with atmospheric open plains and bustling wooden villages. Mikkelsen is utterly convincing and looks perfectly at home in this setting - an effortlessly cool presence, the Danish actor brings a steely gravitas and strong authority to the fold here. Alongside this power, Mikkelsen subtly reveals a broken quality in the character as Jon seeks his revenge in a haze of grief and anger. Given her high billing and star power, Eva Green is given little to do here - which falls prey to the traditional genre problem of failing to utilise its female characters (For exceptions see: The Homesman, Sweet Vengeance & The Quick and the Dead). Green plays the mute wife of one of the slain outlaws, who has become something of a slave to her brother-in-law, Delarue. With no dialogue, Green is simply given a lot of pensive staring to do - and credit to her talent as an actress, she manages to make something of a memorable impact. Scenery-chewing support from Jeffrey Dean Morgan, Eric Cantona and Jonathan Pryce adds some further grisly fun to the proceedings also. 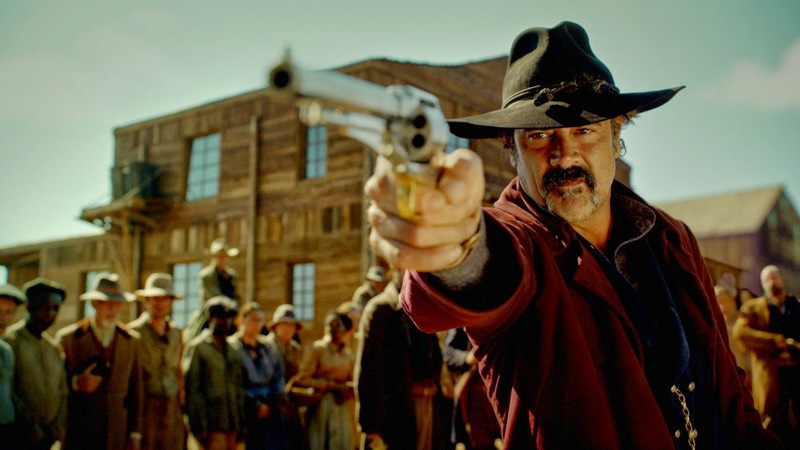 The Salvation is not without its flaws, but it's nonetheless a satisfying revenge western. Mikkelsen anchors this piece, alongside well executed blood-soaked direction and boldly enigmatic cinematography. However, this one proves a little too short to be completely sweet. Verdict: "A tremendously enjoyable revenge western, hampered by its short runtime"